This paper outlines the scientific background for the EU climate protection target - the 2oC limit - established by the EU Governments in 1996 and reaffirmed since then by the Environment Council 2003, and European Council, 2005, 2007. The paper also identifies how this target may be achieved through global action. The Fourth Assessment Report of the Intergovernmental Panel on Climate Change (IPCC AR4) indicates that the global mean temperature increase provides an important common metric for analysis of many climate change impacts associated with global warming. In highly vulnerable areas, such as parts of Africa, Asia and small island states in the Pacific and the Caribbean, serious regional impacts are already occurring. Significant global impacts on ecosystems and water resources are likely at global temperature rises of between 1 and 2°C, and the risks of net negative impacts on global food production occur at temperature increases upwards from 2-2.5°C, compared to pre-industrial levels. Analysis of current atmospheric greenhouse gas (GHG) concentrations indicates that only a narrow window of opportunity exists to ensure that these serious negative effects can be avoided. Within the next 10 to 15 years, global GHG emissions need to be shifted to a pathway consistent with the 2°C target. This can be achieved with technologies that already exist or are being developed, provided the appropriate incentives are given. However, the necessary departure of emissions from the present business-as-usual trends implies, on a global scale, immediate and substantial investment in these low-carbon technologies. The IPCC AR4 indicates that, up to 2050, substantial global emission reductions by at least 50% below 1990 levels are needed with additional global emission reductions beyond 2050 towards a zero carbon economy by the end of the century. Recent work on mitigation costs indicates that meeting the 2°C target could be achieved with GDP losses of at most 2.5% by 2050 (reducing annual growth by at most 0.05%/year), and with lower costs for earlier years. When taking into account co-benefits in terms of air pollution reduction, net costs could be significantly lower. ​​The costs of actions to mitigate climate change are small when compared to the relative costs of impacts due to inaction. 1 A global mean temperature rise implies higher warming over land than over oceans, with the tropical regions warming least and the northern polar region warming the most. • Negative effects of climate change are already observed at the current global mean temperature increase of 0.8°C above pre-industrial levels. • Global mean temperature increases of up to 2°C (relative to pre-industrial levels) are likely to allow adaptation to climate change for many human systems at globally acceptable economic, social and environmental costs. However, the ability of many natural ecosystems to adapt to rapid climate change is limited and may be exceeded before a 2°C temperature increase is reached. • A global mean temperature increase greater than 2°C will result in increasingly costly adaptation and considerable impacts that exceed the adaptive capacity of many systems and an increasing and unacceptably high risk of large scale irreversible effects. • In order to have a 50% chance of keeping the global mean temperature rise below 2°C relative to pre-industrial levels, atmospheric GHG concentrations must stabilise below 450ppm CO2 equivalence. Stabilisation below 400ppm will increase the probability to roughly 66% to 90%. • Current atmospheric GHG concentrations and trends in GHG emissions mean that these concentration levels may be exceeded. The 2°C target can still be achieved if this overshoot of concentrations is only temporary and reversed quickly. Thus, to avoid a warming in excess of 2°C, global GHG emissions should peak by 2020 at the latest and then be more than halved by 2050 relative to 1990. • Deep emission reductions can be achieved by employing a broad range of currently available technologies and technologies that are expected to be commercialised in coming decades. • Deployment requires clear, consistent and effective policies and incentives. ​• The costs of climate change impacts are directly related to their magnitude which increases with global temperature and may be between 5 and 20% of GDP or even higher in the long-term. • The costs of actions to mitigate climate change are small when compared to the relative costs of impacts due to inaction. • Some of the costs of impacts can be reduced through investment in adaptation. • According to recent studies, mitigation needed to meet the 2°C target is projected to cost at most 2.5% of global GDP in 2050 (reducing annual growth by at most 0.05%/year) if policies are designed in a cost-effective way. These costs are reduced significantly when co-benefits (i.e. reduction in air pollution health damage, air pollution control costs and energy security) are included. • Such mitigation, via a portfolio of coordinated policies including a long-term carbon price and the recycling of tax/auction revenues to promote low-carbon technologies and to improve market efficiencies, could even lead to global GDP gains (above those due to avoided climate impacts). ​The ultimate objective of the UN Framework Convention on Climate Change (UNFCCC) as stated in Article 2 is to stabilise atmospheric greenhouse gas (GHG) concentrations at a level that would prevent dangerous interference with the climate system. Such a level should be achieved within a time frame sufficient to allow ecosystems to adapt naturally to climate change, to ensure that food production is not threatened and to enable economic development to proceed in a sustainable manner. The EU considers that this objective would be achieved by limiting GHG concentrations to levels that would keep the increase of global mean temperature below 2oC relative to pre-industrial temperatures2. This view is based on the assessment of the impacts and risks expected to occur, or to which the world would be committed as the global mean temperature approaches 2oC above pre-industrial temperatures, as well as those that are expected to occur if the global temperature increases beyond this level. The EU’s global temperature target of 2°C above pre-industrial was first established in 1996 during preparations for the Kyoto negotiations, and has been reaffirmed subsequently in various Environment Council and European Council conclusions. This limit was deduced in 1996 from the evidence available at the time, mostly from impacts studies that were assessed in the Second Assessment Report of the Intergovernmental Panel on Climate Change (IPCC SAR, 1996a,b,c). However, such studies tended to look only at the impact of doubling CO2 from pre-industrial levels to 550ppm. A further consideration in setting a limit was the concern that rates of change needed to be limited to less than 0.1°C per decade in order to allow ecosystems time to adapt. Since then, the information provided in the IPCC’s Third Assessment Report (IPCC TAR, 2001a,b,c,d), and developments in the scientific literature and in peer reviewed publications such as “Avoiding Dangerous Climate Change” (Schellnhuber et al., 2005) supported and advanced the scientific basis for the assessment of impacts and risks that underpin the adoption of the 2oC target and confirms our view that 2oC is an appropriate target. The IPCC’s Fourth Assessment Report (hereafter: IPCC AR4), the Stern Review Report on the Economics of Climate Change (Stern, 2006) and the European Commission communication “Limiting Global Climate Change to 2 degree Celsius” (European Commission, 2007a) provide further and improved scientific, technical and socio-economic analyses. The comprehensive analyses and new findings in these reports are the main sources for the information contained in this paper. Pre-industrial being defined as 1850-1899 average global mean surface temperatures. The 2oC limit cannot be considered to be entirely ’safe’, as severe impacts are likely to occur increasingly as the global mean temperature rise approaches 2°C above pre-industrial levels. Changes in extremes such as heat waves, droughts and extreme precipitation events will largely shape future climate impacts. In particular, significant impacts are expected for species, ecosystems and water resources, low latitude agriculture, and small island states. The latter will be increasingly impacted by the direct and indirect effects of sea-level rise. Impacts are already being observed which are consistent with or which can be attributed to warming to date. This document provides an overview of the EU’s assessment of the climate change impacts underpinning the 2°C target (Chapter 2 “Impacts & Vulnerabilities”) and the implications for global emissions (Chapter 3 “Emission Pathways”). Achievement of the 2°C target implies ambitious global GHG emissions reductions and a rapid reversal of current trends of rising emissions. The wide technology portfolio available for reducing emissions is presented (Chapter 4 “Mitigation Options”). The necessary deep cuts in global emissions will likely have to draw on the widest possible range of reduction options. Finally, the most recent literature on the economics of mitigation are summarised (Chapter 5 “Economics of Climate Change”), highlighting once more that the costs of inaction are likely to far outweigh the costs of climate change mitigation. Anthropogenic emissions of greenhouse gases perturb the global climatesystem, resulting in an increase of global mean temperature, changes in weather and precipitation patterns and increased climate variability resulting in a higher frequency of extreme events. There is significant regional variation in climate change and its impacts. In general, warming will be stronger over land areas than over the oceans, and some continents and regions will be subject to larger changes than others. In many regions, current differences in the distribution of precipitation tend to be amplified, i.e. wet regions generally will become wetter and dry regions will become drier. In addition to the impacts mediated via the climate system, increased atmospheric CO2 concentration results in ocean acidification, which will have significant negative consequences for marine biology (WBGU, 2006). Global mean temperature is an important indicator for communication of the causes and consequences of climate change and provides a common metric for the assessment of impacts of global warming. However, the global average temperature does not capture the details of spatial variability and the large variety of effects that occur at regional and local levels. The global mean temperature has risen by approximately 0.8°C above pre-industrial levels3 (IPCC AR4 WGI SPM). Unless otherwise stated, all temperatures given in this paper refer to changes of global mean temperature relative to pre-industrial levels. Many climate change related impacts, such as coral reef bleaching, glacier retreat and changes in the frequency of extreme weather events are already evident (IPCC AR4 WGII). These impacts are expected to intensify and become more widespread in the future. The intensity of climate change impacts will accelerate as temperatures increase (IPCC AR4 WGII) (see Fig. 2.1 and 2.2). Moreover, the uncertainty of climate change impacts increases substantially with increasing levels of global warming. 3 Here defined as temperature change since 1850-1899 (beginning of instrumental temperature records). At that time the anthropogenic influence was small compared to natural variation; temperatures in the late 19th century are in good agreement (order of 0.1°C) with conditions before the onset of industrialisation in 1750. The Fourth Assessment Report of the IPCC’s Working Group II (WGII), indicates that climate change will affect a wide variety of natural and anthropogenic systems in all regions. The IPCC AR4 strengthens and advances the risk assessments provided by the Third Assessment Report (IPCC TAR, 2001b). For a number of areas of concern, the assessed risks are higher in the AR4 compared to the TAR assessment, particularly at lower temperatures. If global warming is limited, many impacts of climate change can be addressed through effective adaptation. With increasing levels of climate change, however, there are fewer options for successful adaptation. There is very limited knowledge on the limits and costs of adaptation. Significant reductions in emissions to meet long-term mitigation goals substantially decrease the level of adaptation required. Increasing levels of climate change are associated with increasing pressure on ecosystems. Many ecosystems will not be able to adapt to the projected rates of change. Particularly vulnerable ecosystems include coral reefs, Arctic ecosystems, Alpine ecosystems and tropical forests, which are likely to be severely impacted at levels of global warming approaching 2°C. A global mean temperature increase exceeding 2-3°C would increase the risk of extinction for about 20-30% of species and have widespread adverse effects on biodiversity and ecosystems. Increases significantly above this range are projected to lead to significant extinctions of species and, at just above this level, widespread mortality for coral reefs. Global losses are irreversible; therefore the impacts on biodiversity are of key relevance. There is a still poorly understood risk that temperature increases above 2-3°C could cause major and irreversible damage to the Amazonian rainforest and its biodiversity and, as a consequence, exert a strong positive feedback on the climate system by turning Amazonia into a large carbon source. The world’s polar regions are particularly vulnerable to climate change. Decreasing snow and ice cover in the northern hemisphere has reduced the reflection of sunlight back to space, amplifying climate change effects in northern high latitude regions (IPCC AR4 WGI). A mean global temperature increase of 3°C by the end of the 21st century corresponds to an increase in annual mean temperature of 5-7°C in the central Arctic Ocean (IPCC AR4 WGI, Ch. 11.8.1). Winter Arctic temperature increases are projected to be four times higher than the global mean increase. The extent and depth of Arctic sea ice in the summer time is presently observed to be reducing rapidly, with 2007 producing record losses. Some of the IPCC AR4 generation of climate models projected summer ice to disappear almost completely by the end of the 21st century if the global temperature increases beyond 3°C (IPCC AR4 WGI, Box 10.1, Ch. 10.3.3.1). The likelihood of abrupt changes in Arctic sea ice increases significantly with increasing anthropogenic GHG emissions (IPCC AR4 WGI, Ch. 10.3.3). Observed sea ice losses significantly exceed the rate of ice loss projected by the coupled ocean atmosphere models (AOGCMs) participating in the IPCC AR4 assessment for the period 1953-2006 and there is increasing concern that summer sea ice may be substantially eliminated well before the end of the 21st century (Stroeve et al. 2007). The loss of Arctic sea ice is likely to strongly perturb atmospheric and oceanic circulation patterns, to threaten the existence of sea ice-dependent ecosystems and species, and to change the marine food chain as well as the living space of about two hundred thousand indigenous people. Based on the projected loss of sea ice in the AR4, the polar bear (Ursus maritimus) has been assessed as facing a high risk of extinction with warming of 2.8°C above pre-industrial (range 2.5-3.0°C) (IPCC AR4 WGII, Box 4.3, Table 4.1). Earlier loss of ice at lower temperatures would lower this temperature threshold. ​​More than one sixth of the world’s population live in snowmelt- and glacier-fed river basins and depend on these systems for water resources. These basins are subject to increased river runoff during the peak spring and summer melt time, causing structural damage and flooding. Whilst water flows increase at first with glacial melting, as glacier mass declines, melt and runoff will substantially decrease. This will result in substantially increased water stress in such regions, e.g. the Ganges basin which is home to about half a billion people. The timing of this decrease depends on the individual region and on the rate of warming and varies from one decade (Andes) to many decades (Himalaya). High altitude, mountainous and Alpine regions are undergoing major changes. Most mountain glaciers are receding rapidly. Many small glaciers are projected to disappear during the 21st century, while large glaciers will suffer a substantial reduction in volume. The duration and depth of snow cover is projected to change with global warming. As outlined above, changes in glaciers and snow cover will have a strong impact on the water sector in many regions. Melting permafrost due to rising temperatures will destabilise mountain walls and increase rock fall. Endemic Alpine biota are highly vulnerable to climate change, and their adaptive capacity is limited. There is a disproportionately high risk of extinction in various mountain ecosystems. Risks to food production and security are projected to differ greatly by region. Above a global temperature rise of 1.5 to 2°C there is an increasing risk of a decline in global food production. Even below this level, at lower latitudes, especially in the seasonally dry tropics, agriculture will be negatively affected by climate change with negative impacts on the yield of major cereal crops. Food security and agricultural incomes are likely to be under threat in many regions of Africa, Asia and Latin America. In mid- to high latitude regions, increases in local temperature of 1-3ºC are projected to lead to small increases in yield which are reversed for higher temperatures (IPCC AR4 WGII, Ch. 5.4, 5.6). Human health will be strongly affected by climate change. Severe heat stress has already caused loss of life in Europe (cf. Section 2.2) and other regions of the world. Even a moderate temperature increase well below 2°C is likely to result in negative impacts in the health sector such as increased burden from malnutrition, increased incidence of diarrhoeal diseases and many vector-, food-, and water-borne infectious diseases. In particular, it will lead to a net increase in the geographic range of malaria and dengue fever. At higher levels of global warming, the negative impacts in the health sector are projected to become more severe. Adverse health impacts will be greatest in low-income countries (IPCC AR4 WGII, Ch.13.4.1). Increases in global mean temperatures will result in significant changes in the intensity, frequency and location of extreme events such as heat waves, flooding, wildfire and tropical cyclones, even below 2°C rises in temperature. Greater warming is projected to further substantially increase the risk, frequency and intensity of many extreme events. Extended heat waves are projected to become more intense and frequent, adversely affecting human health, natural ecosystems, agriculture, and the power industry (IPCC AR4 WGII, Ch. 12.6.1). Heat and drought will also strongly increase the risk and severity of wildfires. Tropical cyclone intensity (peak wind speeds and precipitation) is projected to increase with increasing tropical sea surface temperatures, and hence with increasing levels of global warming (IPCC AR4 WGI, Ch. 3.8.3 and Box 3.5; WBGU, 2006, Ch. 3.1.2). Above a global warming of 2-3°C, a greater increase in winter rainfall in combination with a loss of winter snow storage will increase flooding in many regions. High levels of global warming also imply a strongly increased risk of dam bursts in glacial mountain lakes. ​​Even if the global temperature is stabilised, sea level would continue to rise for many centuries to millennia due to the enormous thermal inertia of the oceans and the slow melting of major ice sheets. Higher levels of global warming will result in a larger rise in sea level. Sustained global warming greater than 1.5-2.5°C is a threshold beyond which there is likely to be a commitment to at least partial deglaciation of the Greenland ice sheet, and possibly of the West Antarctic ice sheet, causing sea level rise of 4-6 m over centuries to millennia. For global warming of 3°C, WBGU (2006, Ch. 3.1.1.4 and Table 3.1-1) projects the global sea level to rise by as much as 2.5-5.1 m by 2300. Coastal zones are home to about one fifth of the world’s population and population growth rates in these areas are very high. Sea level rise, possibly in combination with changing atmospheric circulation patterns coastal erosion and has impacts on groundwater levels and ecosystems in coastal zones. Small islands are especially vulnerable to an increase in sea level. The impacts of climate change are not evenly distributed across regions and sectors. At global warming levels below 2°C, a few sectors in certain regions might benefit from climate change (e.g., agriculture and tourism in high latitude regions), while in most other regions and sectors effects are likely to be negative, and sometimes even severely so. 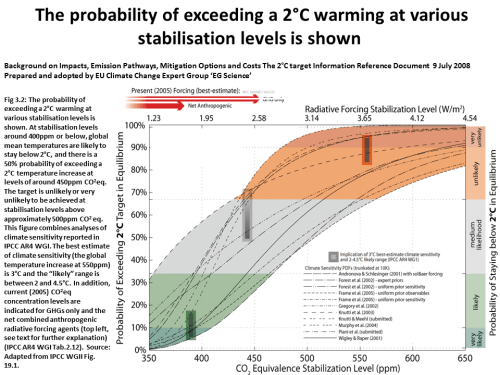 For many countries, a 2°C warming limit may not be wholly safe. Generally, less developed areas are at greatest risk due to both higher sensitivity (e.g., small islands) and lower adaptive capacity (IPCC AR4 WGII, Ch. 19.3.7). Climate change is identified as a major obstacle to poverty reduction objectives and achievement of the Millennium Development Goals (IPCC AR4 WGII, 2007; Stern, 2006). In developed countries, the poorest also tend to be the most vulnerable to climate change (Stern, 2006). Climate change tends to increase differences in economic wealth both between regions of the world and within individual countries. Given that industrialised countries are responsible for a large amount of the GHG emissions and that emissions are strongly related to consumption, this raises issues of international and social equity. As temperature increases in excess of 3°C, there will be net negative impacts in developed countries and also even more severe net negative impacts in many developing countries (IPCC AR4 WGII, Ch. 19.3.7). Climate change could, within a few decades, become a major threat to international security (WBGU, 2008). Climate change will add an additional burden to already existing pressures in relation to food security and water availability in many unstable regions, particularly in the developing world. Moreover, climate change is likely to increase storm and flood disasters. The population in already politically unstable states with poorly performing governments and institutions will be most affected, since climate change will overwhelm local capacities to adapt (WBGU, 2008). Climate change is likely to induce additional migration both within national borders and internationally. Europe and North America are likely to have to face substantially increasing migratory pressure, and this migration will likely become an additional source of destabilisation on national, regional and international scales. Many economic sectors and activities will be adversely affected by climate change (Stern, 2006). Current studies estimate that, for a global mean temperature of up to 2 to 3°C above pre-industrial levels, positive market impacts (such as increasing crop yields in higher latitude regions)​​ almost balance the negative market impacts of climate change, giving rise to aggregate impacts of plus or minus a few percent of global gross domestic product. However, positive impacts are not likely to be evenly distributed and most people, particularly in developing countries, would be negatively affected (IPCC AR4 WGII, Ch. 19.3.7). With further increases in global temperature, the net damages are likely to increase at a disproportionate rate (Stern, 2006). Cost estimates increase if non-market impacts are considered (Stern, 2006; IPCC AR4 WGII, Ch. 19.3.7). A more detailed discussion on the costs of climate change is provided in Section 5. The European Environment Agency (EEA), IPCC and other regional and national analyses have provided extensive analyses on the impacts of climate change for Europe (EEA, 2004; IPCC AR4 WGII, Ch. 12). The magnitude of impacts is expected to increase as global temperatures rise. Europe, however, may have the capacity to substantially reduce the adverse impacts outlined here by undertaking adaptation measures (European Commission, 2007b). In 2003, large parts of Europe were affected by an extended heat wave. This resulted in about 35,000 heat-related excess deaths (IPCC AR4 WGII, Ch. 12.6.1). A similar but less intense heat wave occurred in the summer of 2006. Increased evaporation and lack of precipitation during these heat wave events threatened water resources, causing adverse impacts in many economic sectors. Crop losses, heat-stress on livestock and widespread forest fires resulted in losses in the agriculture and forestry sectors. Extremely low river flow rates resulted in disruption of inland navigation. In combination with high water temperatures, the low water levels in rivers also forced a reduction of electricity generation in thermal power plants which utilise water cooling. The frequency of such extremely dry summer conditions will increase at a disproportionate rate (IPCC AR4 WGII, Ch. 12.6.1). Such heat wave events will become much more severe and frequent even with a 2°C temperature increase. The conditions experienced in 2003 could become the norm for the latter part of the 21st century under a non-mitigation scenario (IPCC AR4 WGII, Ch. 12.6.1). about its magnitude. For large parts of the Mediterranean, a decrease in summer precipitation of up to 30-45% (in some parts up to 70%) is projected for the end of the 21st century for a scenario corresponding to a global warming of 3-3.5°C. For Scandinavia, an increase in winter precipitation of 15-30% is projected (IPCC AR4 WGII, 12.3.1.1). Such a precipitation change would exacerbate existing water stress in southern and south-eastern Europe and increase the frequency of drought. In these regions, agriculture already relies heavily on irrigation, and irrigation requirements are thus projected to increase. Changing precipitation patterns and larger climate variability are likely to increase the risk of floods in northern, central and eastern Europe (IPCC AR4 WGII, Ch. 12.4.1). An increase in the frequency of intense short-duration precipitation events will likely increase the risk of flash-floods in most of Europe. Europe has many low-lying coastal areas, many of which are densely populated and therefore vulnerable to sea level rise. The coastal strips of the North Sea running through eastern England, Belgium, the Netherlands, north-western Germany and Denmark as well as the Po delta in northern Italy are Europe’s most threatened coasts (WBGU, 2006). Regional influences may result in sea level rise in Europe exceeding the global mean increase by 50% (IPCC AR4 WGII). Maintaining the 2°C target is important for limiting the risk of destabilisation of polar ice sheets, which would contribute substantially to long-term sea level rise (cf. Section 2.3). Mountain regions are amongst the most vulnerable natural systems in Europe and climate change adds to other environmental stresses. Glaciers in the Alps are retreating at a rapid pace; for each degree of local warming, the snow line moves upward by about 150 m (EEA, 2004). Thawing of Alpine permafrost causes destabilisation of mountain walls and increases the frequency of rock falls. Fragile Alpine ecosystems are forced to move uphill and will eventually disappear. Recent findings indicate that impacts on biodiversity will be disproportionately severe in the European mountain regions, where the species loss by 2080 is projected to be as high as 60% for a high emissions scenario (IPCC AR4 WGII, Ch. 4.4.7). Climate change may also severely affect the tourism sector in mountain regions. In the Austrian Alps, for instance, an increase of 1°C may lead to some 70 fewer skiing days per year, depending on altitude (IPCC AR4 WGII, 12.4.9). and forestry sectors alone (Stern, 2006 Box II5.4), mostly due to losses in crop yield, heat-stress on livestock and forest fires. Projections estimate a more than 10-fold increase in annual flood losses in Europe by the end of the century for a global warming of 3-4°C, some of which, however, are driven by economic growth and an increase in physical assets. Adaptation measures such as strengthening of flood management have the potential to significantly limit losses (Stern, 2006, II5.4). In assessing the level at which anthropogenic interference with the climate system must be considered “dangerous”, a particular focus should be given to instabilities, positive feedbacks and irreversible changes in the climate system – in risk management language, low probability, high impact events or processes. Once a certain level of warming has been reached, self-amplifying processes may result in a transition of the climate system to another state. Thresholds for such processes are called “tipping points” in the climate system (IPCC AR4 2007, Box 10.1; Lindsay and Zhang, 2005; Hansen et al., 2007, Lenton et al., 2008). They include especially the irreversible melting of the Greenland ice sheet, the risk of disintegration of the marine based West Antarctic ice sheet, a weakening or even complete shutdown of the Atlantic Meridional Overturning Circulation (MOC), often termed the thermohaline circulation (THC), and climate change-induced release of greenhouse gases from the land biosphere. All these processes have the potential to trigger large-scale changes, some of them irreversible on the timescales of centuries to millennia, with dramatic impacts. The amplified warming of the atmosphere at high latitudes and ocean warming threaten the Greenland Ice Sheet (GIS) and the West Antarctica Ice Sheet (WAIS). These account for water masses equivalent to approximately 7m and 5m of global sea level rise, respectively. Due to their thickness and the great thermal inertia, complete melting would not occur abruptly, but would likely take many centuries to complete. Rapid decay of these ice sheets, or even partial disintegration, leading to multi-metre sea level rise over centuries to millennia is likely if warming is large enough and sustained for long enough. A multi-metre sea level rise would be a key impact due to the large magnitude of the consequences, its irreversibility and the likelihood that it would exceed the adaptive capacity of many regions (IPCC AR4 WGII, Ch. 6 and 19.3.5.2). ​​Above about 2°C warming, there would be, with medium confidence, a commitment to widespread to near-total deglaciation of the Greenland ice sheet leading to 2-7m sea level rise over centuries to millennia (IPCC AR4 WGII, Ch. 19.3.5]. For the West Antarctic Ice sheet5, scientific confidence is lower; however it could be anticipated with low to medium confidence that for warming of over 2°C there would be a commitment to partial deglaciation with 1.5-5 m sea level rise over centuries to millennia (IPCC AR4 WGII, Ch. 19.3.5]. Even a warming of 2°C may commit us to a sea level rise from melting ice sheets, and this risk greatly increases for greater warming. The MOC is an important mechanism for the global redistribution of heat. It is largely responsible for the mild climate in the North Atlantic basin. According to IPCC AR4, a complete shutdown of the MOC is considered to be very unlikely to occur during the 21st century. The likelihood of large-scale MOC responses increases with the extent and rate of warming. In a risk context, it is to be noted that the likelihood in the 21st century (<10%) may still be significant given the high consequences of an abrupt shutdown: these include adverse effects on food production and terrestrial vegetation, changes in fisheries and effects on oceanic CO2 uptake and oceanic oxygen concentrations, an increased warming of southern hemisphere high latitudes and tropical drying. Adaptation to the impacts of a shutdown of the MOC is very likely to be difficult if the impacts occur abruptly (IPCC AR4 WGII, Ch. 19.3.5.3). Rapid ice loss from the Greenland ice sheet or rapid addition of freshwater fluxes from the Arctic flowing rivers would increase the risk. Coupled climate models project a decrease in the MOC of up to 50% or more by the end of the 21st century due to warming of the surface waters and increased precipitation in the North Atlantic (IPCC AR4 WGI, Ch. 10.3.4). Slowing down of the MOC decreases warming in Europe caused by the anthropogenic greenhouse effect, a process which is already embedded in the present generation of coupled ocean atmosphere models (AOGCMs). 4 The model based threshold of global average warming for the onset a net loss of ice from Greenland is in the range of 1.9 to 4.6°C above pre-industrial levels (IPCC AR4 WGI, Ch. 10.7.4.2). large stores of marine hydrates at high latitudes (IPCC AR4 WGII, Ch. 4.4.6, and 15.4.2). These feedbacks are generally expected to increase with climate change. Some models indicate a risk that the land biosphere turns into a net source of CO2 by the 2050s. In these models this is mostly due to climate-driven decline of vegetation in South America and the loss of soil carbon due to increased respiration. A number of models also project an increase in biogenic methane emissions from wetlands and permafrost associated with a warming climate. Methane is the second most important contributor to the anthropogenic greenhouse effect. Several studies indicate that a warming of 2°C would result in ca. 20% growth in methane emissions from wetlands (IPCC AR4 WGI, Ch. 7.4.1.2), and the emissions are likely to further increase at higher temperatures. Furthermore, methane stored in the form of methane hydrates on the seafloor and in permafrost soils could become increasingly unstable with rising temperatures. Even though a catastrophic, sudden release of large amounts of methane is considered unlikely to happen on short to medium time scales, ongoing chronic release of methane as a result of anthropogenic warming could result in a substantial increase in its atmospheric concentration, thus further amplifying climate change (IPCC AR4 WGI, Ch. 7.4.1.2). ​​• In order to have a 50% chance of keeping the global mean temperature rise below 2°C relative to pre-industrial levels, atmospheric GHG concentrations must stabilise below 450ppm CO2 equivalence. Stabilisation below 400ppm will increase the probability to roughly 66% to 90%. ​​The implications of the EU 2°C target for future GHG emissions are outlined here. If no action is taken to reduce GHG emissions, global mean surface temperatures are projected to continue to increase, and will rise by more than 2°C above pre-industrial levels as early as the middle of this century. The IPCC AR4 indicates that, by the end of this century, global temperatures may increase to 2.3°C (“likely” range between 1.6°C and 3.4°C) for the lower and 4.5°C (2.9°C to 6.9°C) for the higher non-mitigation emission scenarios (see Figure 3.1 below and IPCC AR4 WGI, Tab.SPM3). The complexity of the climate system does not allow the temperature response to GHG emissions to be estimated with absolute certainty. The IPCC AR4 provides temperature ranges associated with different GHG stabilisation levels (expressed in CO2 equivalent - CO2eq). For example, the IPCC estimates that doubling the atmospheric GHG concentration relative to pre-industrial levels (i.e. to about 550ppm CO2eq), is likely6 to increase the global temperature by at least 2°C and up to 4.5°C above pre-industrial temperatures. The best guess is that this doubling of concentrations will cause a global temperature increase of 3°C. This analysis also implies that, at a concentration of 550ppm, CO2eq the probability of keeping the temperature increase below 2°C is 5-17% (see Figure 3.2). 3.2 How to achieve low GHG stabilisation levels: Peaking of concentrations a medium-term necessity. Current atmospheric GHG concentrations and emission trends indicate that meeting the EU climate protection target is very challenging. The current atmospheric concentrations of long-lived greenhouse gases i.e. CO2, CH4, N2O and halocarbons, are equivalent to about 450ppm CO2eq. However in addition to the warming effect of these GHGs, man-made aerosols have a cooling effect and black carbon a further warming effect. Although these vary considerably by region, their net global effect, together with the greenhouse gases, gives a warming effect equivalent to a best-estimate of about 375ppm CO2eq (IPCC AR4 WGI, Tab.2.12) (see Figure 3.2). Note that future aerosol emissions, and their regional net cooling effects on the climate, are assumed to decrease with increased effectiveness of air pollution control policies around the world. Because of the inertia of the climate system, the equilibrium temperature associated with higher GHG concentrations will not be reached if these concentrations are reduced rapidly enough to a lower stabilisation level, e.g. if the atmospheric GHG concentrations peak at 475 or 500ppm CO2 equivalence, and are then further reduced to a lower level (see Figure 3.3). In order to ensure a high degree of probability of staying below 2°C, urgent action is required to reduce global GHG emissions so that atmospheric concentrations will peak in the near future and return to a lower stabilisation level (see IPCC AR4 WGI, FAQ10.3). Translating the concentration requirements into emission pathways is subject to considerable uncertainties, primarily due to uncertainties in the carbon cycle. The IPCC WGIII analysed a large set of mitigation scenarios available in the literature and categorised them according to their maximum 21st century concentrations.